Cesar Millan and Rachael Ray: America's Great Escape Artists. During the Great Depression of the 1930s, the American people, desperately in need of relief from fears about the future, turned for escape to movie stars Fred Astaire and Ginger Rogers for champagne and chiffon, horseracing icon, Seabiscuit, for inspiration and heart, and heavyweight boxer, Joe Louis, for action and grace. Similarly, Americans in 2006, with different fears about the future, also look for escape. No longer admired by the rest of the world, vulnerable to attack from within and without, and helpless to prevent greedy fingers from emptying our pockets faster than Streisand can schedule another comeback tour, we need to get away from it all. To whom do we turn today for solace, now that movie musicals, star horses, and the Brown Bomber are gone? Easy. We're turning in droves to two proven comfort givers, dogs and food. Daily relief is being gobbled up by millions of viewers of National Geographic's "Dog Whisperer," Cesar Millan, and the Food Network's Rachael Ray. The public is avidly behind both contemporary stars, each of whom has a book on the best-seller lists. "Cesar's Way: The Natural, Everyday Guide to Understanding and Correcting Common Dog Problems," and "Rachael Ray 365: No Repeats -- A Year of Deliciously Different Dinners (A 30-Minute Meal Cookbook)." America is tuning out, and turning on to dogs and food. In addition to best sellers, both icons have hit TV shows, and Cesar Millan has a dozen DVDs on the best-seller lists, while Rachael Ray has several shows on Food Network: 30 Minute Meals, $40 a Day, Inside Dish, and Tasty Travels, plus ten cookbooks, cookware, and a popular magazine, "Every Day With Rachael Ray," published by Readers Digest. One is American by birth, the other by choice. Cesar Millan, who, according to the May 22nd issue of The New Yorker, crawled across the border 14 years ago, has no formal trainer training. He taught himself about dogs while he was growing up on his grandfather's farm in Sinaloa, Mexico. As a child, he was called "el Perrero," the "dog boy." He patiently watched and studied dogs' behavior until he was able to imagine himself inside the dog's head, and could anticipate the dog's next move, as well as how to control it. That was the birth of National Geographic's Dog Whisperer. Author Malcolm Gladwell's Profile on Cesar Millan for The New Yorker, called "What the Dog Saw: Cesar Millan and the Movements of Mastery" likens Cesar's physical movements to both politics and dancing. The article rhapsodizes over similarities between Millan and "movement masters" Ronald Reagan and Bill Clinton, and the grace of Millan's movements as studied by Karen Bradley, head of the graduate dance program at the University of Maryland. Cesar thought he was a dog whisperer but he might really be Barishnikov. 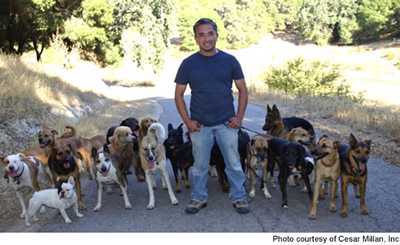 Viewers hooked on his hit show watch Cesar Millano train the owners, more than the dogs. There are no bad Rottweilers, no bad Pit Bulls, and no bad Chihauhaus, just owners who often allow their dogs get away with running the whole show, like a spoiled child. In Mexico, a person is a person and a dog is a dog. Then Cesar came along and pointed out the reason why dogs should be dogs: there's only one pack leader and that job rightly belongs to the person who pays the rent, and that's rarely Fido. When this fact is accepted by owners, their pet problems are pretty much solved. Ask Oprah. She called Cesar's 911 for help with her dog, Sophie, who had issues with other dogs. Oprah worked hard to earn her new tee shirt from Cesar, which loudly proclaims Oprah "Pack Leader." Sophie's much better behaved now that she's been socialized by a pack of Cesar's dogs. Cesar operates the Dog Psychology Center in South Central Los Angeles, where troubled dogs, like those rescued in the wake of Katrina whose owners have not yet been found, can learn to get along with each other while the search for their owners continues. Though Cesar is generous with hugs for his clients, the kisses are reserved for his wife, Illusion. Though Cesar's professional attention is not required for Rachael Ray's beloved pit bull, IsaBoo, they have something else in common. Rachael has also helped Oprah, giving her some 30-minute meal tips. Called the "Kitchen Queen" by fans and the media, Rachael Ray's winning personality is closer to quick-witted, warm Julia Child than to aloof, cool Martha Stewart. A famous episode of Julia Child's PBS series shows the master chef dropping a chicken on the floor, and an episode of Rachael Ray's Food Network series shows her shaking a bottle of A1 sauce; the top falls off and the contents shoot across the kitchen. "Don't try this at home," laughs Rachael, a master of the quick save. Accidents happen in real life and it's refreshing to see no cover-up on TV shows. Just like home. Rachel's easy, running patter is fast, funny, and continues as she piles up ingredients chin high from cabinet to counter. This no-frills approach is enormously endearing. She's one of us, even if she does chop veggies faster. She describes the aroma and taste of each ingredient, and her presentation of the finished meal is excellent. Her presentation of herself is excellent, too. She doesn't dress as though Rodeo Drive is outside her door; she dresses like real people do, and sometimes, she's even (gasp) a little overweight. Unlike most television chefs with state-of-the-art cooking equipment at eye level, she has to bend down to use her oven, just like regular people with regular ovens. According to her magazine's website, Ray comes from a long line of cooks. Her maternal grandfather grew and cooked everything for his family of 12, and her dad's family was steeped in the food-rich traditions of Louisiana. The Rays owned a family restaurant on Cape Cod, eventually relocating to upstate New York, where her mother went to work as food supervisor for a restaurant chain. "I was surrounded by all different styles of cooking and worked in the food service industry in just about every capacity you can imagine." Rachael landed at Macy's Marketplace in New York, first at the candy counter, then as the manager of the Fresh Foods Department. She helped open Agata & Valentina, a prestigious New York gourmet market, where she was store manager and buyer. Being on New York's fast track wasn't as appealing to Ray as the Adirondacks had been, so she went back home, and managed pubs and restaurants at Lake George's very upscale Sagamore resort. Rachael was recruited by Cowan & Lobel, a large gourmet market in New York's state capital, Albany, as food buyer, and she added to that the job of chef. To increase sales during the holidays, Ray began a series of cooking classes, which quickly became a happening. The cooking course taught thirty "30-Minute Mediterranean Meals," and became so popular that the local media sent a feature reporter to cover the phenomenon. The following week, WRGB-TV/CBS Albany-Schenectady, approached Ray about doing a weekly segment, 30-Minute Meals, for the evening news. Nominated for two regional Emmys the first year, the show was a major success. Her companion cookbook sold 10,000 copies locally over the holidays. "My life has been a total accident, a very happy, wonderful accident that I didn't and couldn't have planned," says Ray. Despite her growing celebrity, she is determined to stay grounded, and still lives with her family in a cabin in the Adirondacks. We might still be afraid of the future but, with Americans like Cesar Millan and Rachael Ray, we're learning how to be pack-leading, home-cooking, less-fearful escape artists.